Overcoming adversity and running just his fifth race of the 2016 season since June after injury, Kyron McMaster won the territory’s first medal in its 30-year history of IAAF World Jr. Championships competition, when he claimed 400m Hurdles bronze on Saturday in Bydgoszcz, Poland. 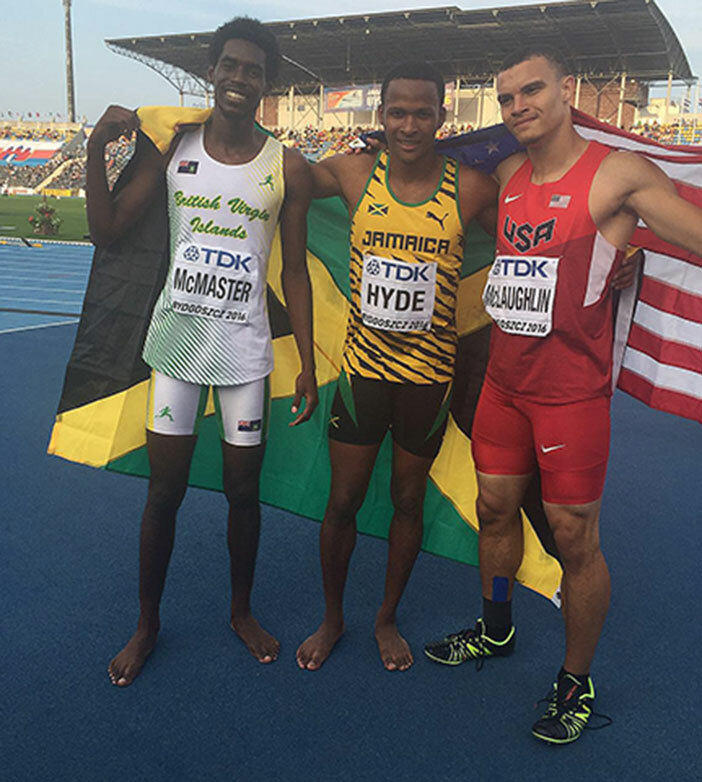 McMaster placed third behind Jamaica’s Jaheel Hyde who successfully defended his title in 49.03 seconds—becoming the first two times winner—and the USA’s Taylor McLaughlin, who passed him just before the line for silver, in a personal best of 49.45 as he grabbed third place with a personal best and National Record, 49.56. “To come here in 2016 and make each of the rounds to the final and win a medal, is a big deal for me,” he said. Through early May, McMaster wasn’t even thinking about World Juniors. As a student at Central Arizona and winning the Jr. Colleges Indoor 400m title in March, he turned his focus on competing in the Carifta Games but missed the meet and the outdoor season after Doctors told him not to run because of a lower back stress fracture. McMaster said being out of collegiate competition affected him badly. If he had the chance, he would have come into the meet with a higher ranking. He said being released from Central Arizona—before being able to even compete outdoors—put him into a different zone where he had to strive and become more focused. McMasters’ 49.56 seconds run breaks Antigua and Barbuda Rai Benjamin’s Leeward Islands Record of 49.82 and is .06 off Grenada’s Shane Charles’ OECS record of 49.51 from 2006. McMaster and Grenada’s Anderson Peters are the only OECS athletes winning World Jr. Championships medals—the first pair of males in the region to ever do so at the championships—after Peters grabbed Javelin Throw bronze with a personal best and national record throw of 79.65m.